"Swamp Sunshine" That is the title that this special little gem of the Cypress Swamps and Bottomland Forests deserves. 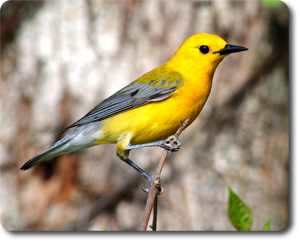 The Prothonotary Warbler is a flash of Golden Light in the dark forests they call home and they are one of the most striking Yellow Birds on Planet Earth. They are absolutely stunning and their loud song rings through the woods and makes the swamp come alive. Captured in the Blackford Creek Bottoms near my Hometown of Maceo, Kentucky.